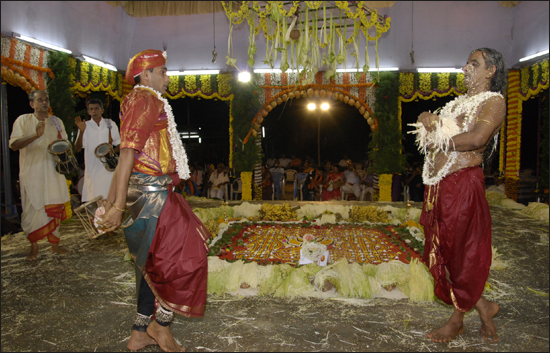 Chariot Festival of Mahotobhaara Shree Mahalingeshwara Temple, Puttur was held on April 17, 2010. 71 feet high Brahma Ratha or Chariot was the highlight this time. Though it rained heavily for about an hour during the night of Chariot festival and created a mess for the people gathered, once it stopped raining people gathered again with the same enthusiasm at the festival grounds. Before Chariot festival begins, there is cracker festival held, witnessed and applauded by thousands gathered. Sky filled with colors during this time, is a treat to watch. But this time, due to rains cracker festival began at about 11 pm. So I could not see the whole of the festival. Here are some of the photos from the festival.